This is gorgeous Tina. Love the colour. I bet it looks even more awesome. I.R.L. if that is possible. Hello, Thanks for sharing your card with us at Crafty Friends Challenge Blog… your card is lovely and fits perfectly with our ‘Floral’ challenge theme… please join us next time and good luck in the draw. This is gorgeous Tina, such a beautiful flower. Love that large sunny bloom with the simple style sentiment, wonderfully CAS. Samo nekaj dni namakanja v morski vodi, pa toliko zamudim, me skrbi, da sploh ne bom prišla na zeleno vejo ... še sreča, da imam dopust ;-) Čudovito si ustvarjala - hvala za ustvarjalno razvajanje, ki sem si ga pravkar privoščila na tvojem blogu! Very striking! Thanks so much for sharing with us at Cupcake Inspirations! Kul. Tudi jaz sem gledala njen video in si označila, da moram poskusit. Krasno ti je uspelo. 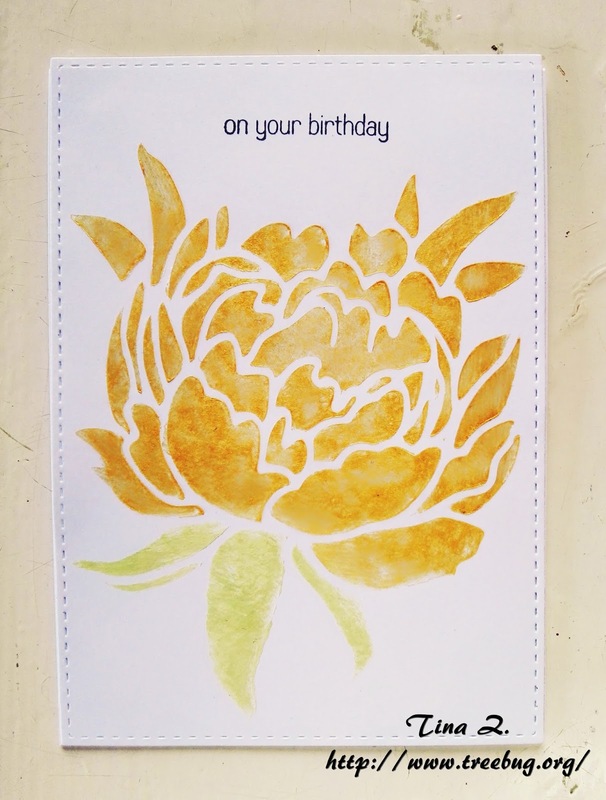 That is a very beautiful flower stencil and I really like how you've kept it the central focal point of your card. Thanks for playing at Uniko. So warm and lovely! Thank you for sharing your art with us at STAMPlorations Theme & Sketch challenge! Sorry for the very late visit! I have obviously been taking too many vacations! What a terrific sunny card! Thanks so much for joining in the CAS challenge at Happy Little Stampers.